Laura Parquette sent this great photo showing the Ballhooter lift up top at Snowshoe Mountain’s 4848′ elevations! 4″ of snow had fallen as of AM Sunday with more than a foot of snow in the forecast. 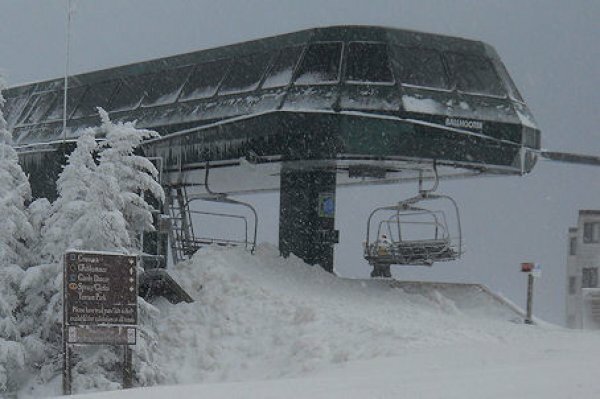 Opening Day at Snowshoe and all of the West Virginia ski areas is looking like a POWDER opening! HighCountryWeather.com is a privately owned and operated website. It is not a part of any association or weather organization and is a free service of appnet.com. Photo submissions: All photos of the day are either images that have been submitted to us from visitors to post, from our own photographers or from the ski areas themselves. If you submit an image, it must be your own or in Creative Commons, and by submitting it you are giving us permission to use it on SkiSoutheast/SkiNC or any of our creative designs. Please submit images that are relatively large, the ideal size being 1200 pixels or wider. Please include a description of your photo, so that other readers know what they're looking at.